Ships from and sold by Home and Hardware Supply. Sold by M&R Industries and ships from Amazon Fulfillment. 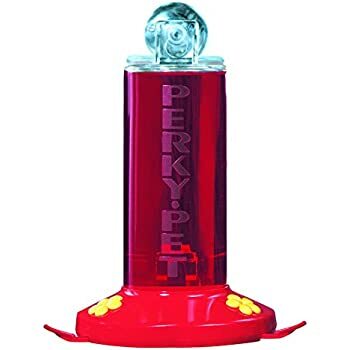 Fun for bird lovers of all ages, this Perky-Pet Window-Mount Hummingbird Feeder lures hummingbirds in for a thrilling, intimate view of them hovering, perching, and sipping sweet nectar. 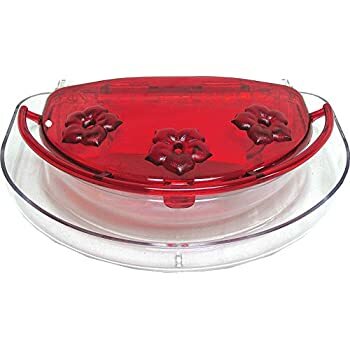 Because of this feeder's convenient window-mount design, you'll be able to enjoy watching hummingbirds from the comfort of your couch or while at the table having dinner with your family or working on art projects with the kids. 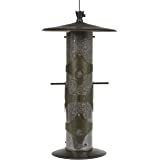 More sightings means more enjoyment for you, and with this feeder, hummingbirds are hard to miss. They'll appreciate the reliable place to dine, while you get to enjoy all that enticing cuteness--buzzing wings, iridescent color, and tiny features--up close. 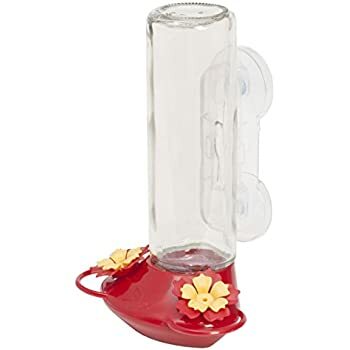 Holding up to 8 ounces of nectar, this hummingbird feeder features a transparent, shatterproof, plastic reservoir and a bright-red plastic base that will quickly capture the attention of hungry hummingbirds. 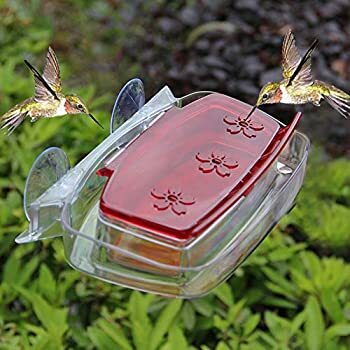 Its rounded, gently sloped base comes equipped with two flower-shaped feeding ports and two detachable perches that offer a restful place for hummingbirds to comfortably perch while they sip nectar and survey their surroundings. 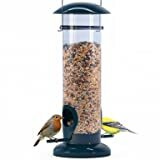 Use the included suction cup to securely attach the feeder to any outside window. Perhaps on a kitchen window for charming company when sipping coffee with a friend or washing dishes at the sink. A den or living-room window works well, too. 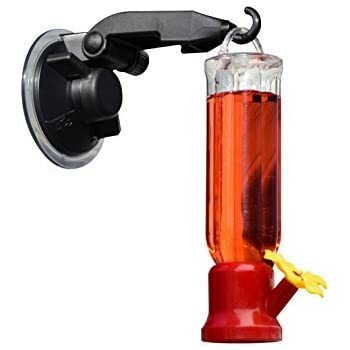 As an alternative to using the suction cup, this hummingbird feeder can also be hung by a screw or nail in a different location, like on the side of a tree or attached to a post. Either way, the feeder promises sensational sightings throughout the day. Q. 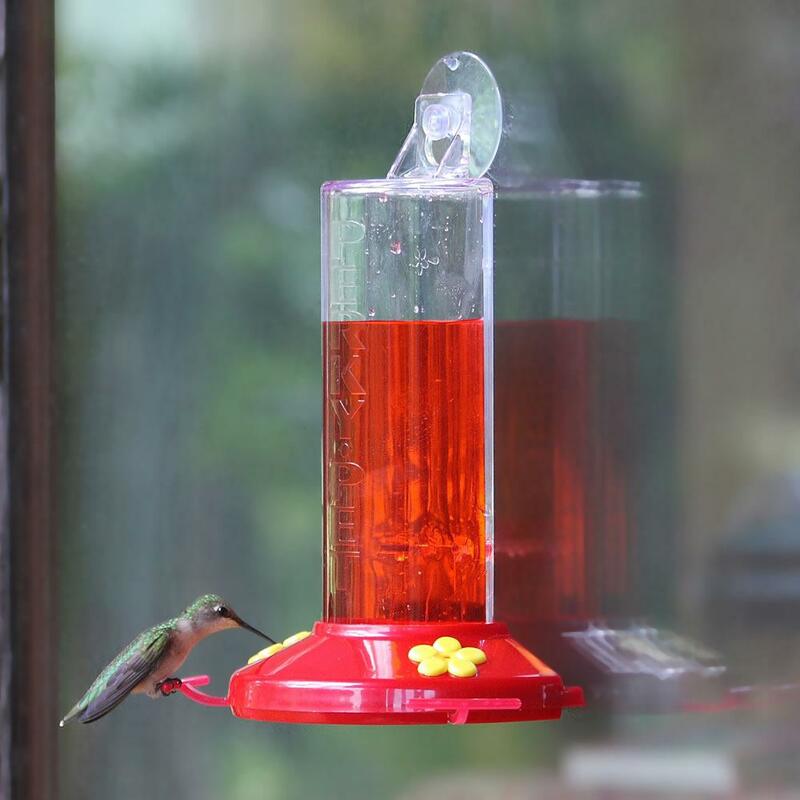 What criteria should I use when selecting a hummingbird feeder? A. Make sure it is one that will be easy to clean and fill, especially since you will need to clean the feeder every few days. 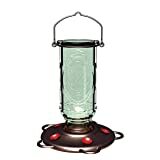 If you are worried about bees and wasps or ants invading the feeder, purchase a hummingbird feeder with bee guards. Q. 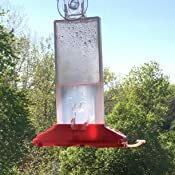 How do I clean my hummingbird feeders? A. Hummingbird feeders need to be cleaned every 1-2 weeks. Use hot water and a bottle brush, along with mild soap; be sure to rinse thoroughly. 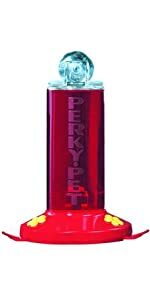 The Perky-Pet cleaning mop is specifically designed for the purpose of cleaning hummingbird feeders, and is very convenient to use. This cleaning mop can also be used on seed feeders and oriole feeders for those small, tight spaces that are difficult to reach. Q. What is the importance of providing water for hummingbirds? A. Hummingbirds need fresh, clean water just as much as they need nectar. Hummingbirds stay healthy by using water not just for drinking, but also bathing, cleaning their feathers and to remove parasites. Waterers are better options than bird baths because they provide hummingbirds with fresh, clean water that prevents dirt and debris from contaminating it. In hotter climates or seasons, providing water for hummingbirds makes it easy for them to have access to a water source and retain their energy. 6 oz. 8 oz. 14 oz. 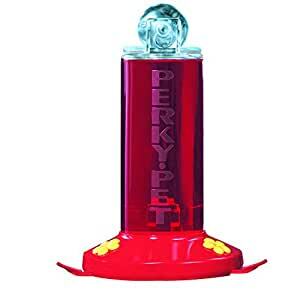 Perky-Pet’s 8 oz Window-Mount Hummingbird Feeder features a no-drip feeding base with two easy feeding flowers and two perches. Mount the feeder on your window with the included suction cup or hang it with a screw or nail elsewhere. Kids love to watch the birds feeding, which is a great way to teach them about wildlife and migration. 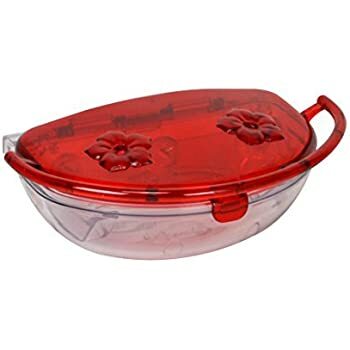 The feeder is easy to fill and clean. 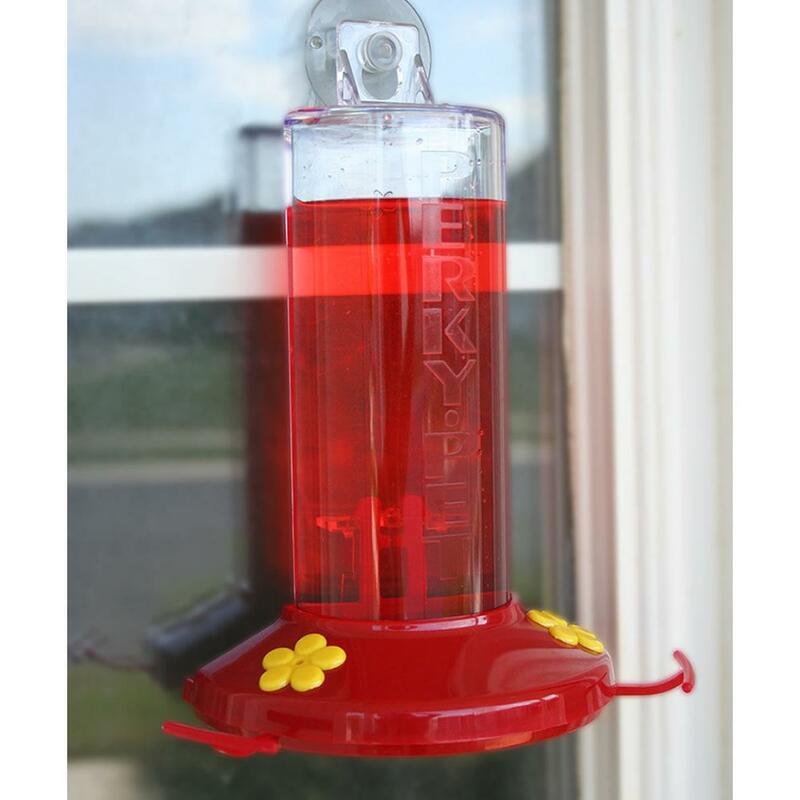 The Window Mount Hummingbird Feeder easily attaches to a window, wall, or post, so you can enjoy watching hummingbirds from the windows of your house. 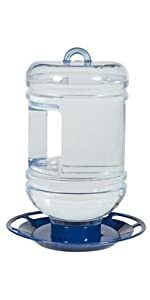 The clear acrylic feeder bottle is built for strength and durability. 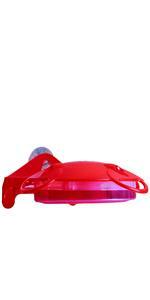 It has an 8 fl oz nectar capacity and quick release clips, so moving the feeder is easy and convenient. The feeder has an easy-to-clean wide-mouth design and a no-drip feeding base so nectar will not be wasted. The two feeding stations each have perches and snap-on yellow flower accents to add interest and attract hummingbirds. There are more than 300 species of hummingbird in the Western Hemisphere, and, with this hummingbird feeder, you're bound to see at least a couple of them at your window. 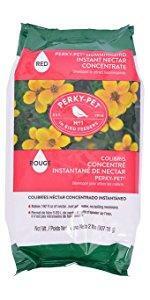 Perky Pet's 8-ounce plastic feeder features a no-drip feeding base with two easy feeding flowers and two perches. Mount the feeder on your window with the included suction cup or hang it with a screw or nail elsewhere. Kids love to watch the birds feeding, which is a great way to teach them about wildlife and migration. The feeder is easy to fill and clean, and comes with a one-year warranty. 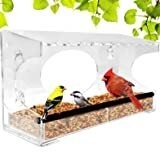 5.0 out of 5 starsBetter than the rest for a window feeder! I’ve had several of these feeders over the years and they’re great! I put them on my kitchen window and they hang well on the strong suction cup and each holds 8 ounces of liquid. If I put 1 feeder out I’ll get 5-6 regular hummers. Some years I’ll put 2 out for the season depending on how mv uch food I want to be mixing up cos during the hot summer months the hummers drink a lot! The feeder is well made and lasts 3-4 years at least. The feeder in the pic I’ve had for 4 years and unfortunately, I dropped it and broke one of the prongs in the back which holds the 2 pieces together. That’s why I’m ordering a new one since that feeder won’t last since I broke it. I’ve tried other feeders and they were either too small or didn’t last! The hummers are fun to watch and love these feeders❣️ One suggestion, don’t buy that expensive red liquid hummer food sold in stores-the food coloring is bad for them. Making your own is simple: In a 32oz. bottle add 8oz. regular white sugar plus 24 oz. boiling water and mix (shake). When cooled down, keep refrigerated until ready to use. The liquid doesn’t need to be red to attract the hummers-believe me! I am happy to report that the company sent another replacement and this one worked perfectly. I highly recommend the product and the company. I have purchased several of these in the past with no problem. I ordered 2 feeders a few weeks ago and when they arrived I put them together, as they come in 2 pieces that fasten together, 1 piece holds the liquid food and the other is the portion that the birds sit on in order to get the food. In the previous order, the 2 pieces did not fasten together, causing the unit to no be usable. 1 feeder worked as it should but the other feeder did not. Amazon was kind enough to send me a replacement for the defective one and when it arrived it, too, would not stay attached together. I called Amazon again and, again, they are sending me a replacement, which I very much appreciate. I just think the company needs to do a better job of quality control and check the items to be sure they are functional before shipping. I love the product, when it works, and am hoping the 2nd replacement will work properly. It always stays in place and seemed very sturdy. I had it up all spring, summer and part of autumn till it got tooo cold for hummers. It never made a mess and also did not get ants trapped in it. However at 4 stories up there are not too many ants. 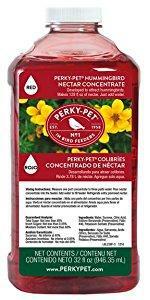 I always use a clear hummingbird food and not a kind with the red dye. It’s healthier for the birds and they seemed to love it. 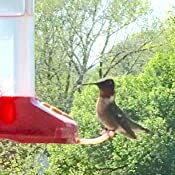 I had several hummers almost ever hour during the daytime. 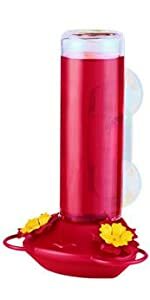 4.0 out of 5 starsGreat inexpensive feeder! 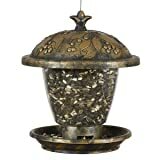 This is our second humming bird feeder of this style. The hummingbirds REALLY love it and it's so much fun to see them coming to our kitchen window. 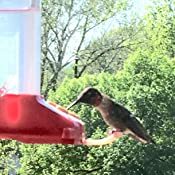 There are two problems though.....the little perches for the hummingbirds break very easily, especially if they have been in the sun for a while. Also, you have to be a bit careful when filling the reservoir, as the "nectar" will spill out if you don't turn it right side up quickly. It's still our favorite feeder, though.....and at this price it's a good deal! How many times have you filled your hummingbird feeder that dangles only to have it empty out on the ground on a windy day? Or those that have a feeding tube that drips constantly? They're all going in the garage sale because this feeder is the bomb. We didn't use the suction cup, we put a screw into one of the posts of the patio cover, which is very near the flower bed where the hummers come, and hung the feeder using the hole that holds the suction cup. 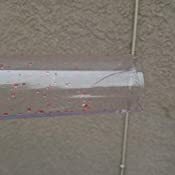 My thinking was that if the wind blew it any at all, I could tie a string or a long twist-tie around the bottom of the clear part and the post to secure it. But so far I haven't had to do that. I prefer that the hummers get their nectar from the flowers because it's better for them, but it's nice to have supplemental feeders in case they're not finding enough. Mounted this way, the feeder doesn't sway in the breeze and the nectar stays in the feeder. It only holds a cup, and I find that's too much, so I only make half a cup of nectar at a time. 2 TBSP sugar to 1/2 cup warm water (this works out to a ratio of one part sugar to four parts water), stir till the water's clear, change it every day. So far I haven't found any ants in it, but if I do, I'll put a Tanglefoot barrier on the lower part of the post. This is an update, I always buy a couple of these to keep in reserve, in case one gets damaged in the midst of hummingbird season, and one of my reserve feeders leaked. From now on, I'll test the red reservoir on the bottom to make sure the seam around the bottom has been adequately glued, as soon as it arrives in the mail. It had been so long since I bought the one that leaked that I didn't think I could return it. Hubs stopped the leak with clear caulking material. But seriously, if you're buying these ahead to use as replacements, do check for leaks. Usually what happens that requires the ordering of another is that the plastic prongs on the red base break. They fit into the clear part so if even one breaks, that renders the whole thing unusable. I'd be a happy camper if these prongs weren't so delicate. I do agree that the plastic prongs that snap into the grooves to hold the clear part to the red part do look a little delicate, so I am being careful to squeeze them gently together when I lock and unlock the parts from one another. So far so good. 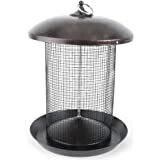 There are only two feeding holes, this being virtually "half a feeder", so I am ordering more. Last fall I had fifteen hummers at my feeders and they fight for feeding rights. I don't see a two-hole feeder being a disadvantage since one hummer will chase all the others away from a four-hole feeder anyway and it's actually better to have several small feeders in different locations than it is to have just a couple of bigger ones. It's also easy to clean. 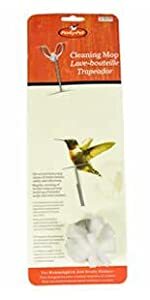 Priced at $11.65 at this writing, and free shipping, you can pay a lot more for a hummingbird feeder that sways in the wind or leaks in some other way. I wouldn't suction-cup it to a window because I think it might be a bit heavy. 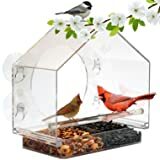 Today I'm ordering a "jewel box" style feeder that's only $7.50, I will review after it's received, I will use that one on a window. Oh, and remember, plastic fades and cracks with long exposure to sun, you'll be putting feeders in the shade, anyhow, won't you? But take them in when the season's over and they'll last a long time.